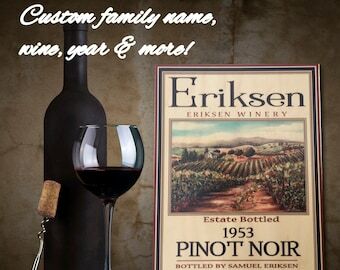 Announcement Mothers Day Sale! 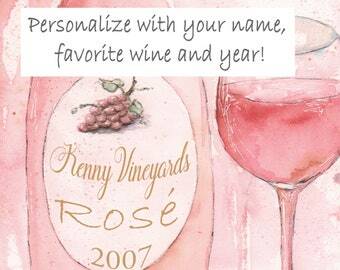 Order your personalized wine PRINT by May 6th and get it by Mothers Day (domestic orders only). To get 15% off of your order, please use the code: MOTHERSDAYSALE2019. Note: The sale is applicable to domestic print orders only. Does not apply to canvases or wood signs. 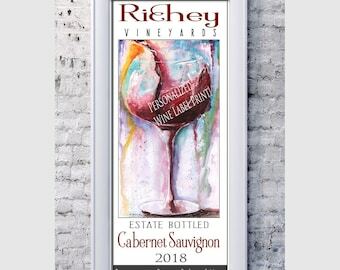 Welcome to my shop where you'll find personalized wine wall art (fine art prints, canvases and wood signs) - all created in my Elmhurst, Illinois studio. Almost anything can be customized so please write to me if you need a special size, etc.. 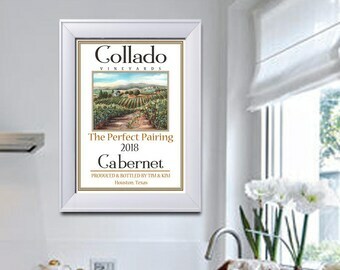 I've been a self employed artist and muralist for over 20 years and have had my murals featured in the Chicago Tribune, Chicago Parade of Homes, Cavalcade of Homes and many model homes in the Chicago area. 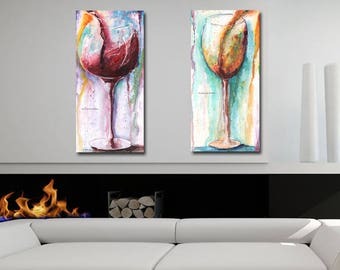 Because so many of my residential murals centered around Tuscan vineyards and wine (and since I LOVE drinking wine) I thought it only fitting that I start a wine themed shop on Etsy. I'm sure you'll be absolutely delighted with your print, canvas or wood sign. Please 'Favorite' my shop so you'll be notified as new prints are listed. I'll be painting new designs and adding them as often as possible. Thank you for visiting my shop and please don't hesitate to send me a conversation with any questions! I also have another Etsy shop (with over 1,100 sales), Nursery Rembrandts, selling children's prints - including my very popular Paris, Italy & London prints - many of which can be personalized with child's name. Mothers Day Sale! 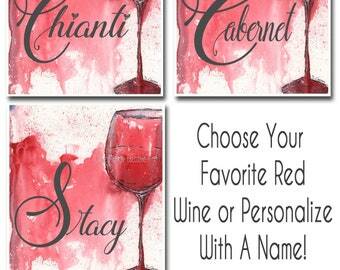 Order your personalized wine PRINT by May 6th and get it by Mothers Day (domestic orders only). To get 15% off of your order, please use the code: MOTHERSDAYSALE2019. Note: The sale is applicable to domestic print orders only. Does not apply to canvases or wood signs. 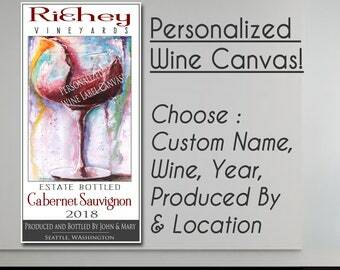 Wine Lover GIFT - Wine Label CANVAS - Personalize Name, Wine, Year, Location - Custom Gallery .75" Thick Wrapped - 7 Sizes 8x10 to 24 x 36"
Mothers Day Wine Canvas - Red Wine Label Personalized With Name, Wine, Year, Location - Gallery Wrapped .75" - 3 Sizes 10x20 to 24 x 36"
Mothers Day Gift For White Wine Lover, Personalized Canvas With Name, Wine, Year, Location, Gallery Wrapped .75" - 3 Sizes 10x20 to 24 x 36"
White Wine Label CANVAS - Personalize With Name, Wine, Year, Location - Gallery Wrapped .75" - Canvas Wall Art - 3 Sizes 10x20 to 24 x 36"
Red Wine Label CANVAS - Personalize With Name, Wine, Year, Location - Gallery Wrapped .75" - Canvas Wall Art - 3 Sizes 10x20 to 24 x 36"
Wine Label CANVAS - Personalize With Name, Wine, Year, Location - Custom Gallery .75" Thick Wrapped - Wall Art - 7 Sizes 8x10 to 24 x 36"
Great print. Had an issue with the first one I received and the seller promptly sent me a replacement. I used a barnwood frame and it looks amazing. Would highly recommend this product and seller. This looks great and we receive a lot of compliments on it. Debbie reached out to me the same day of purchase and sent me the proofs- this was SUPER helpful since I'm a visual person. She even accommodated a minor change in the size to fit my existing frame. Love these!!!! They turned out great. Fast shipping too! Ever since I got my first set of watercolors, at the age of 8 - I have loved painting! I have been painting murals for over 20 years but truly love working in my studio - creating and painting new prints. 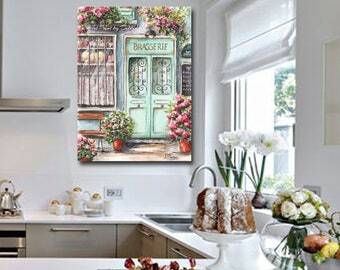 All of my prints and canvases are fine art giclées, reproductions of an original watercolor by myself. 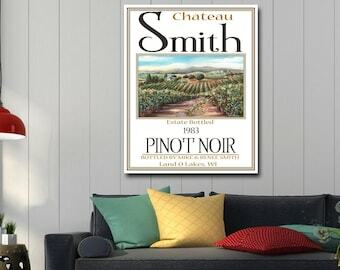 Each print, canvas and wood sign is professionally printed 'to order' with archival inks (lasting more than 100 years). 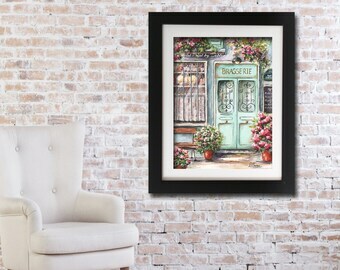 The prints are printed on 205 gsm paper with a smooth soft luster and will capture the essence, feel and vivid colors of the original watercolor painting. 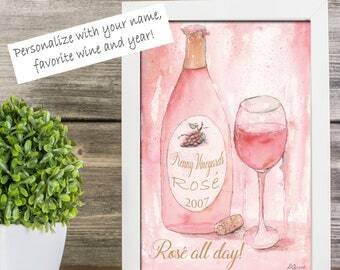 I love to travel (having been to Europe 4 times and Asia 5 times) and love painting vineyards, quaint street scenes and storefronts and fun, unique art that will make a perfect gift or focal point in your home. I am obsessed with watercolors and can't wait to get into my studio every morning! 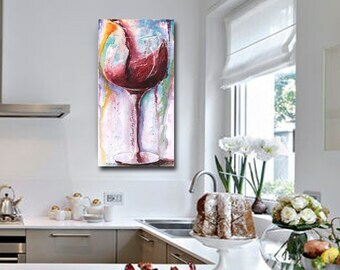 I love painting with a loose, colorful style - and adore luscious dripping colors. Check back often - I'll be adding more prints every week! 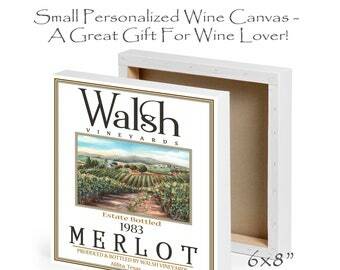 I use a quality print shop to reproduce my fine art prints onto museum wrapped, archival canvases and wood signs. Impact Color LLC is a commercial printing facility that is able to print large format archival quality prints for me. Each print is printed and hand-trimmed to order. 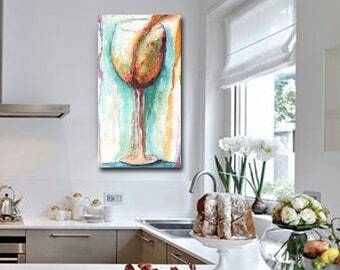 Welcome to Art Prints By Debbie! 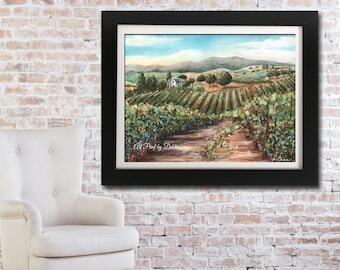 I hope you have found the perfect fine art print for your home or gift. If you can't find exactly what you are looking for, please CONVO me - as I also do custom watercolor paintings. I will refund your money (not including shipping) if you are unhappy with your print - once it has been returned to me in it's original condition. I cannot refund money on custom (personalized) orders, unless there is something wrong with the print. Etsy will handle all payment transactions. I accept Paypal, Credit Cards and Etsy Gift Cards. If you need to cancel an order, please do so within a couple of hours of ordering. Since all orders are professionally printed TO ORDER, I will be processing your order within a few hours of receiving it. I ship all prints by USPS within 3-5 days but usually ship much faster - which means you will get your prints as fast and securely as possible. If you need your print shipped faster, please let me know and I will let you know if it's possible. I will ship prints (11x14 and smaller) in a cello sleeve is a very rigid mailer or small box. Larger prints will be gently rolled and shipped in an un-crushable artwork tube. Between this shop and my second Etsy shop (for children), I have shipped over 800 orders and never had an order damaged in shipping. International Shipping - I am now shipping worldwide by First Class International. Note: Any taxes and duties that are applied and collected by the destination country are the sole responsibility of the buyer. Special Note To UK Buyers: There are new duty and tax rates which are applied by their Countries to imported goods. You can contact HM Revenue & Customs for advice on rates. You can calculate international customs and duty calculator - before making your purchase - to see if you will need to pay taxes in your country in order to be able to collect your parcel. If you find that your costs will be more than you want to pay, please contact me immediately so that I can cancel your order. International shipping charges are generally $12 for Canada and $22 for everywhere else. Please CONVO me before placing an International order so I can let you know shipping costs. I put a lot of pride in my fine art prints - from the initial inspiration to the watercolor original and, finally, the fine art print. I know you will absolutely love it! If, however, there is anything you don't like - please CONVO me immediately. I really want you to be happy! No, I only sell prints, canvases and wood signs. I never sell digital files of my art.